The Board of Zoning Appeals will hold a public hearing on April 24, 2019 at 7:00 regarding an Application for Variances. See attachment within this article for more information. The Township Trustees have approved the 2015 Master Policy Plan and is referenced as the 2015 Comprehensive Plan - located under Zoning Tab. Welcome to the official web site of Hinckley Township. 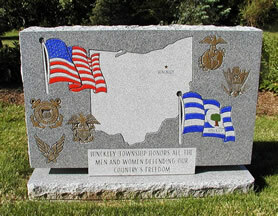 A beautiful country township which maintains an atmosphere of small town life while offering an array of community groups, sprawling parks, and township leadership dedicated to keeping it all running smoothly, describes Hinckley Township. In Hinckley Township you will find a mixture of older rural home sites, newer single-family homes and small planned developments. The township is governed by an elected three-member Board of Trustees who are proud of the township’s debt free status and ability to provide high quality services to residents. The township has ten full-time police officers and the fire and rescue department is staffed by 40 paid volunteers. Safety forces receive constant training in current practices and are active in providing community services. Students living in Hinckley are served both by the Highland Local School District and Brunswick City School District. Buzzard Day, held each March in Hinckley Township, draws thousands of people to the township and has its roots deeply planted in Hinckley history. With the combination of beautiful rolling hills, acres of parklands, rural home sites, and supportive community groups, those who come to live in Hinckley Township live by its motto: Small Town, Big Hearts. The Hinckley Township.Trustees will hold a Special Meeting on Tuesday, April 23, 2019 at 6:30 p.m., for purpose of discussing employment and compensation matters within the Service Department. The meeting will be held at the Hinckley Township Administration Building located at 1410 Ridge Road, Hinckley.